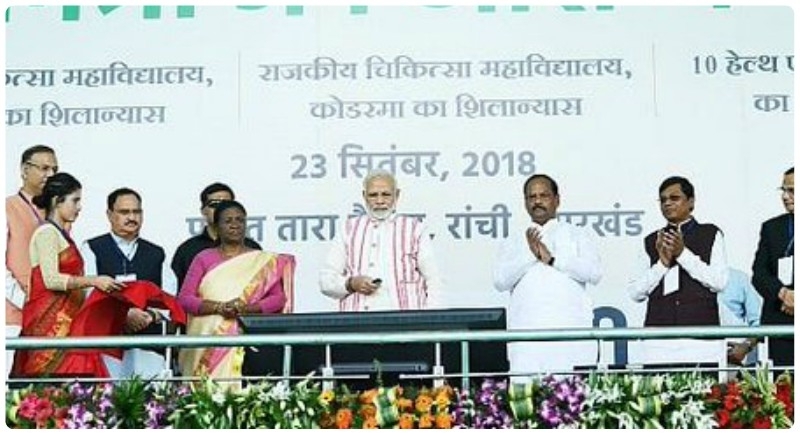 Ranchi, September 24: PM Narendra Modi on Sunday cut the ribbon for one of the biggest health insurance schemes, Ayushman Bharat - Pradhan Mantri Jan ArogyaYojana. Along with this PM Modi unveiled plaques to lay the Foundation Stone for medical colleges at Chaibasa and Koderma. He also inaugurated 10 Health and Wellness Centres. He said the first part of Ayushman Bharat - the health and wellness centres, was launched on Babasaheb Ambedkar's birth anniversary, and the second part - the health assurance scheme, is being launched two days before Deendayal Upadhyay's birth anniversary. The Prime Minister said that the amount of 5 lakhs would cover all investigations, medicine, pre-hospitalization expenses etc. He said it would also cover pre-existing illnesses. He said that people can learn more about the scheme by dialing 14555, or through their Common Service Centre.